I am working on the tree. the large pinecones. The trees in a nearby park supplied the smaller pinecones. Hopefully, I’ll be back soon to show you the decorated tree. 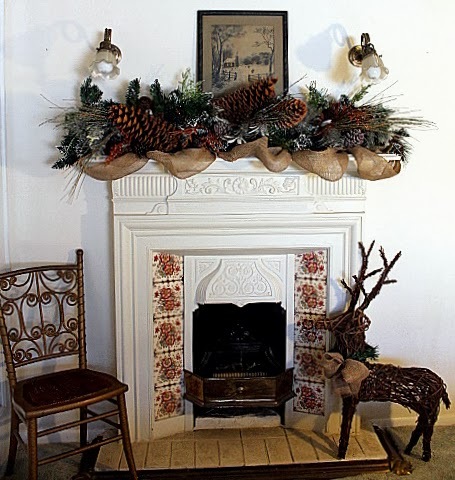 Your mantle looks wonderful – love all the natural items. I think with Thanksgiving coming so late this year it threw everyone off with their decorating. I just finished today – have a few little minor things to finish, but I am DONE. Lovely mantle. I am working slowly in my decor. I finally finalized my tree yesterday! Finished front porch today. Going lightly on decor this year! I love your mantle! The big pine cones are gorgeous. Love it all. Sherry the mantel looks fabulous!! Love the large pinecones! 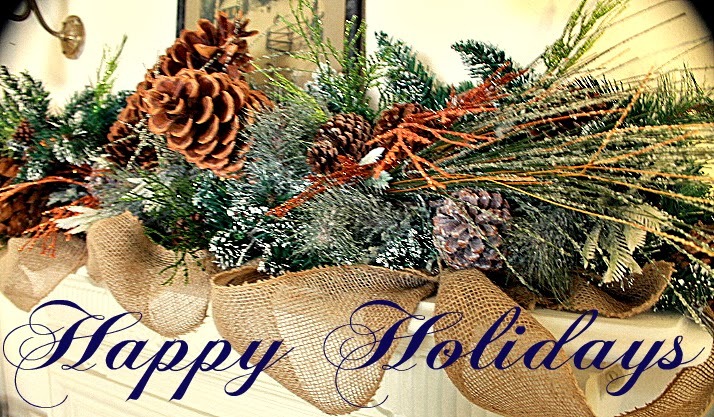 The greenery and pinecones are just perfect and the ribbon adds a classic touch. You did a wonderful job, very festive! I am doing mine tomorrow…why do mantels always make me nervous? lol! Sherry, your mantle is beautiful. The snowy church is so nostalgic and pretty. Back for a second look. your fireplace and mantel is just beautiful, love that old print and the tile in the surround is wonderful! Beautiful Sherry…I am so loving the natural look more and more!!.. So pretty! And I can't tell you how good it is to hear someone else is behind with decorating. Your mantel is just beautiful! I love your use of natural elements. It's very pretty Sherry…luv those huge cones! 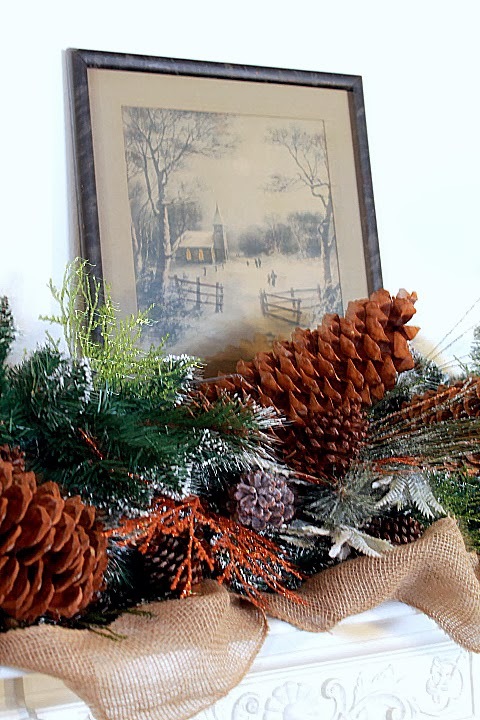 Sherry, your mantle looks gorgeous!So natural…LOVE the big pinecones! there's pinecones in Florida?? 🙂 I love it Sherry, especially how your incorporated the pretty old print in it. Oh I am with you! I was on vacation all last week and am now rushing around trying to get my decorating done in between working and home life. Love your mantel! Sherry, the natural elements in your mantel are wonderful! I love the pinecones! Your mantel is gorgeous! I love all those over sized pine cones! The natural look looks great. The fireplace itself is really charming. LOVE your mantle Sherry! 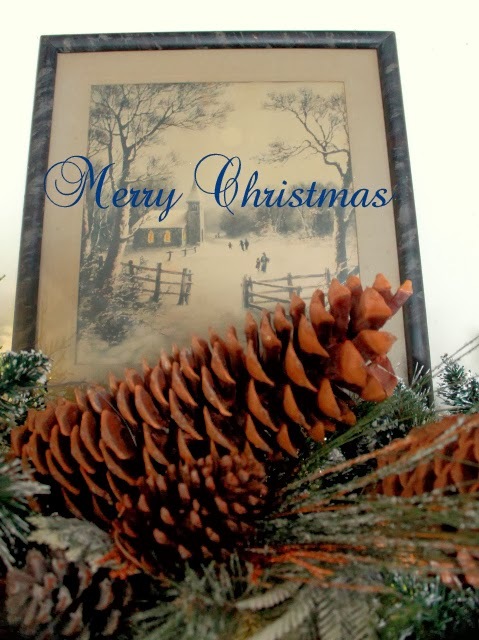 Especially the huge pinecones and the wall art! Your mantel is so pretty! I love the large pinecones, are they from the Ponderosa pine? Your mantel looks beautiful! Love the fullness!! That mantle is just beautiful. Great job. I love your decorated mantel. Your pinecones are so large and grand. I have a few from North Carolina. Your mantel looks lovely. I adore those large pine cones. Merry Christmas. Sherry, your mantel is gorgeous. I love the large pinecones and the print. Your mantel is lovely. I love how serene the neutral colours make it appêar.